Millenials just aren’t buying cars like their predecessors. In fact, the share of new cars purchased by 18-34 year-olds dropped 30 percent in the last five years, according to Edmunds.com. With this sobering information in hand, Ford Motor Company knew a fresh approach was needed to attract this audience. When Ford released the 2013 Ford Fusion + Hybrid, the car company sought to create a buzz in the marketplace. Armed with engaging video content, Ford sought a visual way for people to interact and have a conversation about the Fusion. People were invited to “tell the world what you think” about the new hybrid. Noble Studios made these comments visual in an interactive cloud and map view based on the volume of comments and keywords. These popular terms were highlighted within the map to show how different regions of the United States were describing their Ford Fusion experience. These comments were shared in an interactive cloud view or map view based on number of comments and keywords. Bostonians thought the Ford Fusion was #wicked, while California cruisers thought the Fusion was #cool and, apparently, Midwesterners say #awesome a lot. 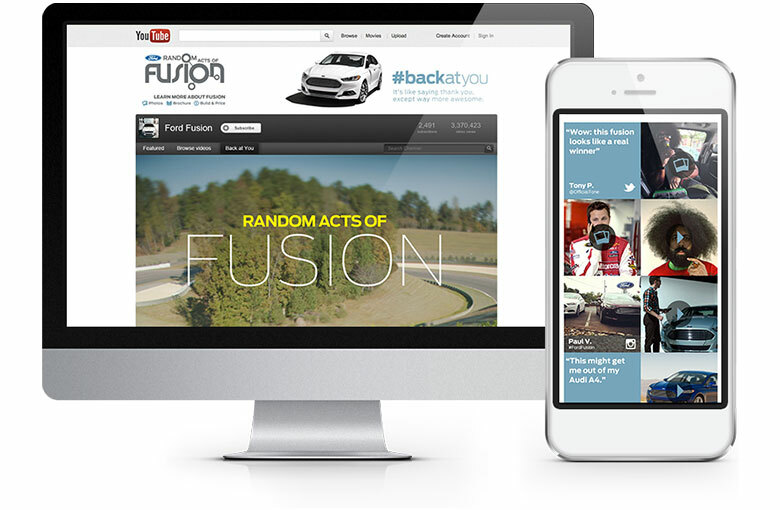 Noble Studios built fully customizable YouTube and Facebook tabs to showcase the 2013 Ford Fusion + Hybrid. We also designed and developed a mobile version of both experiences. The social app captured thousands of customer comments to create a visual, interactive interface which actively responded to a user’s mouse movement. Through the WordPress content management system, Ford could moderate comments, highlight custom phrases within the word cloud, and edit different regions by zip code targeted through the map interface. Additionally, the app included a custom YouTube HTML5 video player and integration with a third party social moderation tool. Ford could highlight several videos within the header carousel. Each video had a trackable social share element which helped gain a better understanding of which videos and social networks were most popular. Deep linking capabilities ensured targeted users were seeing particular videos first in the carousel. The mobile and tablet experiences were controlled with gestures and swipes. Ford controlled the layout order of each section through the CMS. The campaign attracted a large mobile and tablet audience, which comprised 57% of the site traffic. We used key performance indicators to change up the site’s architecture in an effort to continually improve the user experience. With a high volume of the YouTube audience on mobile, we retrofitted the site from adaptive into a fully responsive layout. We also designed layout to keep visitors on the site longer. As a result, the campaign attracted 2,757 new subscribers on its YouTube channel, with the top YouTube video being watched 132,927 times. Facebook likes also increased by 27 percent over 10 months. The campaign attracted a large mobile and tablet audience, which comprised 57 percent of site traffic. On top of that, mobile users had a 75 percent higher goal conversion rate than desktop users in slideshow and gallery interactions, and mobile users had a 49 percent higher return visit rate over desktop users.